Is that email really from your bank? Here’s how to tell. I recently received an email from my bank that stated that they detected multiple attempts to access my account online. I was on my way home and read this email on my phone. For the entire ride home I was nervous. I wanted to pull over and call the bank right away. The email went on to read “to reverse the pending charges please click here and complete the account verification information, if you do not provide this data in 24hrs we will proceed with the charges”. That’s when it hit me, why wouldn’t the bank just call me like the always do for matter such as this? Bottom line, don’t panic. Call your bank as soon as you can and always report incidents like this. All banks have a fraud department email address. You should forward this email to them so that they can inform others of this new scam. 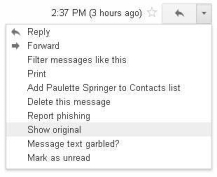 In GMail it’s very simple, right next to the Reply icon there is an arrow that points down for more options, click it and select “Show original”. A new page will open up with a lot of code. Dont panic, you are just looking for a few lines near the top. 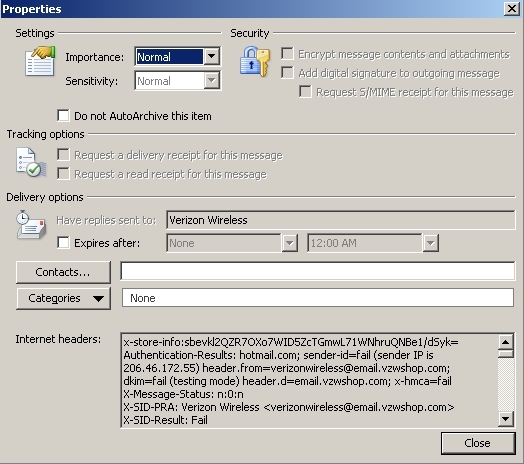 Look for “Deliver-To:”, in a legit email it will have your email address, this is your first clue. Next look for “Return-Path:”, on a legit email the address would be the same as the senders address and it your has the banks domain ( _ _ _ _@bank.com) in the address. Again, don’t panic, don’t click on any links, call your bank and report the fraud attempt. 2 Responses to Is that email really from your bank? Here’s how to tell. it just seems like the first 10 to 15 minutes are generally wasted simply just trying to figure out how to begin. Any ideas or tips?